Muhammad Khan and Kieran Cocker at a show in Attleborough. 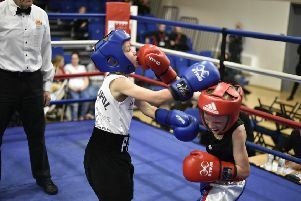 Peterborough Police Amateur Boxing Club had two fighters in action at a show in Attleborough on Saturday night and should have had two winners according to the club’s head coach Chris Baker. Muhammad Khan (15) and Kieran Cocker (21) acquitted themselves well and deserevd to win their bouts. But while Khan quite rightly got the nod on points against L. Thomas from the Norseman ABC, Cocker had a bad decision go against him. He boxed R. McGregor from the Maldon ABC and lost on a split decision. Baker wasn’t happy. All the Peterborough Police boxers should be in action at the club’s home dinner show on May 5 at Peterborough Regional College. Tickets are available now from Chris Baker on 07921095122.